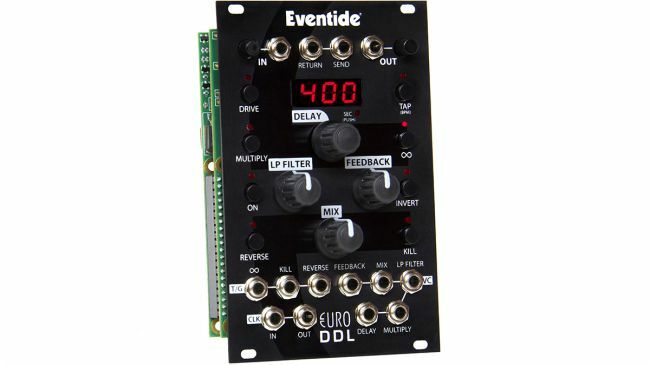 Eventide announced the release of their Eurorack module with the DDL (digital delay line). Designed for performance, the EuroDDL features external control of every feature and function. It also has been designed to sound less digital than the average delay. Eventide’s old school design strictly limits the amount of digital circuitry to only what’s required for delay. Soft saturation clipping, low pass filter, feedback, insert loop, and +20 dB boost are all analog. Available from January, the DDL will cost $399. For more info head over to Eventide’s website! Pioneer have released a DJ-friendly sampler with the DJS-1000 performance sampler! Promising an easy-to-use interface and sporting a step sequencer, multicoloured performance pads and a touch strip, the DJS-1000 also features a 7-inch full-colour touchscreen. This enables you to view information on the sample assigned to each track or the sequence pattern currently playing, you can also switch to a mixer view! Features include live sampling option, the ability to record the inputs and use the sound as individual tracks, MIDI clock and Beat Sync which enable you to sync it to with a track playing on a CDJ-2000NXS2 or XDJ-1000MK2 set-up using Pro DJ Link! Priced from €1,299! The guys over at Slate Digital are on-top of the plugin game at the moment, with the “Everything Bundle” you are able to access all of their plugins for a small monthly payment which seems to be the new fad with software! We’re all for it here! Although the option of owning it outright once the overall fee is paid would be ideal, well maybe someday! The latest addition to that bundle is the Virtual Tube Collection, a collection of 3 plugins that can each act as a preamp, a saturator, and even a virtual tube summing console. Using VTC, you can add color, warmth, depth, and vibe to your mixes and masters. VMS users can also use VTC preamps with the microphone models for rich and vibey tone on their tracks. Check them out in action below! The folks at Native Instruments have been working constantly and had released Maschine MK3! Maschine Mk3 takes the essence of Maschine Studio, adds an audio interface and touchstrip, and packs it all into the optimal form factor for stage and studio. Below you can see the first look and an interview with Product Manager Chris La Pietra! Creators of the most versatile drum plugin are back. Toontrack’s Superior Drummer V3 was released earlier in October and does not disappoint. The world class drum recording software has been 9 years in the making, and it was worth the wait. Not to say that SD version 2 left a lot to be desired, but SD2 has struggled against competition against other software like FXpansion’s BDF3. The centrepiece of Superior Drummer 3 is its massive core library of multisampled drums and cymbals recorded by the legendary George Massenburg in true 11-channel surround. Size-wise, SD3 blows SD2’s 20GB library out of the water with 230GB of recordings downloaded in five separate bundles – the surround channels (which are very usable as additional ambience channels for stereo mixes) add up to almost 100GB alone. Check it out below!